At Villa Landscaping we create comfortable outdoor living spaces. We understand that you are going to spend many hours in your new space and we would like to make it as comfortable and as easy to maintain as possible. We can create the landscaped space that is right for you. 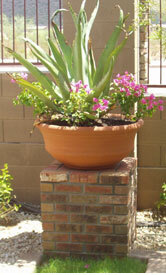 Contact villa@villalandscaping.com with questions, or call (480) 962-1440 for an estimate. Copyright © 2004-2005 Villa Landscaping, Inc. All rights reserved.